A great murder mystery novel that will keep you guessing until the very end! Each page turns another twist, each paragraph expands into a different dilemma of suspicion. What would an old murder mystery and a strange magician possibly have in common? As an old murder mystery case seems to intertwine with a strange magician and his upcoming show, Imara Callan, a young owner of a specialty clothing store, finds herself immersed in the crimes of the past as she tries to understand the circumstances surrounding the disappearance of her father ten years earlier. What other emotions and memories can a return of a best friend bring besides joy and happiness? Imara Callan, the owner of specialty clothing store, ‘Decades of Threads’, thought she had everything in her life moving in the right direction. Business at her store was picking up, her relationship with her sister Sarah was improving, and she was enjoying her life. The return of her former best friend Anna Garst brings a flood of emotions for Imara but it also brings back the memories of a night ten years ago, a murder mystery when Anna’s parents were murdered and Imara’s dad vanished without a trace. How would you find the answers to a murder mystery of your best friend’s family, and mysteries disappearance of your father? While there had been police investigations and inquires into the murders and disappearance, nothing had ever been solved. No answers, no conclusions. It had never sat well with Imara but she had accepted it and moved on with her life, not seeing the need to dig up the pains of the past. Anna, however, after taking a ten-year journey through the world to find herself, is finally ready to confront the murder mystery head on and wants Imara to help, promising to help Imara track down her father. How far would you push to get your answers? As the pair get started, they discover that the mystery was far deeper than they could have imagined. Secrets and lies seem to shroud the details of that fateful night. Each roadblock they get past reveals two more to figure out. As it’s learned they are looking into the details of the murder, strange figures from their past emerge and caution them about that night. With threats and warning, Imara wonders if they should just let the past be but Anna is determined to push on and solve the murder mystery. A mysteries magician, his last public show, and his greatest trick to reveal all the answers to a great murder mystery novel… would you take part of it? With the appearance of a strange magician who is putting on a show which he claims will be a once in a lifetime performance, all the emerging details only serve to confuse Imara and Anna. As the date of the performance gets closer, the magician asks Imara and Anna to help in his show, while also reveling that he knows something about what happened that night, but he’s not showing his hand just yet. In too deep now to back out, Imara agrees to perform in the show. 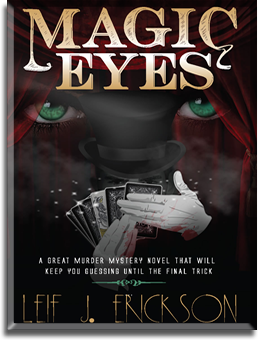 As the full extent of the murder mystery is brought to light, Imara’s image of her parents and her life is bought into question at a magic show she will never forget. A haunting, chilling murder mystery thriller that will grip you and have you on the edge of your seat until the final magic trick is performed.